I'm Dreaming of a White.....Valentine's Day? Well hello there....long time no chat. Honestly where has the month gone? I have been extremely busy designing and assembling wedding invitations, ordering in new product for the store and getting ready for Scrapfest this April. 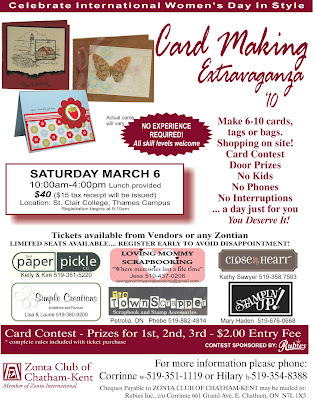 I do want to fill you in about an amazing event coming up this Saturday at St. Clair College put on by the Zonta Club of Chatham-Kent (check out the details to the left). We will once again be participating in this great event. If you are new to the hobby or just looking to add some new techniques to your portfolio, this is one event you will not want to miss. You will move in small groups from station to station throughout the day. In the end, you will have completed 6-10 projects while having a ball! Lunch is provided as well as a $15 tax receipt. All of this for $40?!?! Honestly, you deserve to spend a day like this! Tickets are available at the store. There are still a few spots in the classes happening this week. Check out the details below for Pauline and Linda's classes. Give me a call at The Pickle if you are interested 519.351.5220. I was in some sort of time warp today. Honestly it felt like Christmas! The crazy snow all day and....the arrival of some pretty exciting products including COPICS! We have been waiting for this order for 6+ weeks! Yay! 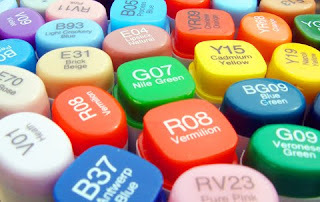 It's funny but Kell even dreamt of these markers last night! Too funny! Now we just need to learn how to use them! Speaking of that, we have added a second date to Linda's technique class. The date is Tuesday March 9th at 6PM. All markers will be available at the store for purchase at the everyday low price of $6.49. Please give me a call if you need me to set some of these aside for you. Have a look at my last post for details! Give me a call at the store if you are interested. Pickle + Etsy = LOVE! 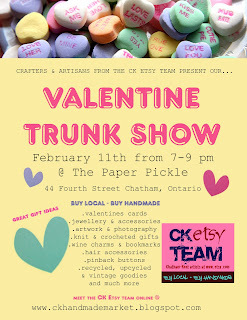 ♥ We will be doing a little Valentine make and take. ♥ There will be a total of 13 (yes, 13!) amazing crafters displaying and selling their works of art. ♥ Guaranteed to be a great time! Stop in and show you care to buy handmade and you care to buy local! Kell and I have been overwhelmed by your reaction to our last post. Thank you for taking the time to comment, email, post on your own blogs and even come into the store to tell us your thoughts. It is SO nice to be loved! I can't believe this but, rumours are already flying that we are closing. This is something that is NOT happening. You can help us by dispelling these rumours when you hear such nonsense. Make sure to tell your friends, Kim and Kell, personally informed you, first hand, that this is NOT true! A New Teacher - Michelle Vink! We are thrilled to introduce our newest scrapbooking teacher. Michelle is a beautiful woman (inside and out) who is married and has 5 terrific kids who she says are 'her inspiration'. She started scrapping about 4 years ago thanks to her daughter who forced her to go to a beginners class. Michelle has been on a design team for about 1 1/2 years and just loves it! She is addicted to scrapping and have a huge passion for photography. You can check out more of her gorgeous works on her new blog or on gallery at ScrapbookDreamer. We fell in love with Michelle's perfectly distressed and vintage style. Her use of chunky embellishments , techniques and eye for details made me fall in love. We were thrilled when she agreed to teach at our store! Michelle will be teaching monthly at the store so make sure you mark your calendars! This round of classes has got me so excited. The girls have certainly stepped up their games. We have a page layout class (finally! ), two great card classes and one in-depth technique class using copics!!!! Please call the store or stop in if you are interested in signing up (DO NOT EMAIL!). As always, advanced payment is required to reserve a spot. Classes must be paid for within 48 hours of calling. If you cannot attend a class after paying, it is your responsibility to find a replacement. This is a one page 12x12 layout class full of techniques! Learn to make paper flower embellishments, work with Prima pearls and flowers, faux stitch, distress, stamp, punch, etc. Great class for scrappers of all levels. It always amazes me what Pauline comes up with for class. These two cards are very different but both gorgeous! On the first card, you will be stamping on black paper and learning how to layer in colour using Prisma pencils. You will also be working with Spellbinders dies, ribbon and liquid pearls. The second card has a rougher and more distressed look. You will be working with edge punches, embossing, using various pigment inks to colour your paper and working with various embellishments. 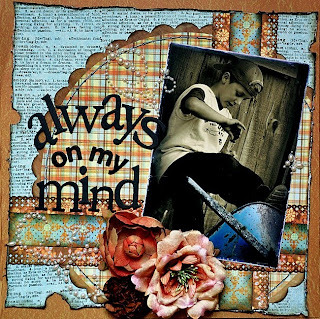 Debbie has designed cards that are great for stampers of all levels! The first card works with impressabilities paired with co-ordinations paper to create and interesting backdrop to an amazing card. You will work with daubers, various inks, edge punches, glaze pens, glitter and more. The second card is great for any occasion. You will make the beautiful papers that serve are the background for the butterfly and verse. You will also work with the crop-a-dile, emboss, work with ribbons and decorative papers. If you are interested in seeing what copic markers are all about, this is the class for you! This will strictly be a technique class where Linda will share inside tips and tricks for colouring images as beautifully as she does! You will spend the entire class taking the time to colour two images (yet to be determined). Linda's style of teaching will be very detailed to ensure you walk out of here with a true sense of how these markers work. Required Supplies: You must come equipped with the Copic markers used in the class (none will be provided). A list will be emailed to you once you register. *Please note that Sketch Copic Markers are scheduled to be delivered Tuesday afternoon. We will have a great selection all at the very competitive price of $6.49!